Green aritst Bonnie Meltzer's sculpture "House Music" incorporates found objects. 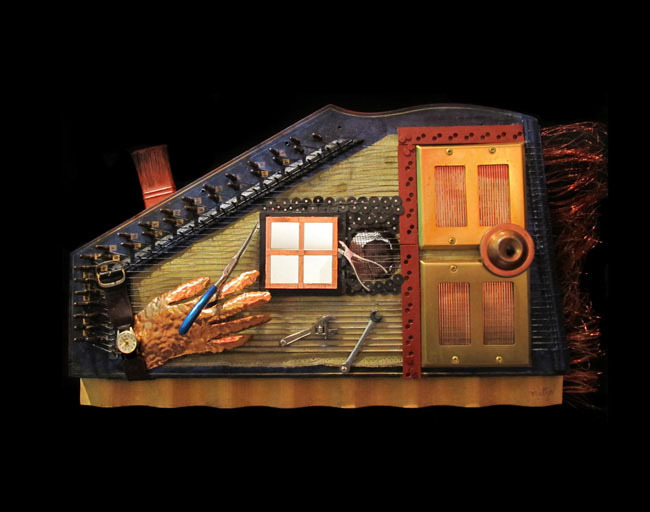 Look closely at Bonnie Meltzer’s mixed-media sculpture, and you’ll begin to notice the eco friendly house is an autoharp, the door is switch plates, and the chimney is a paintbrush. How does she put her found objects together and keep them that way? “I prefer objects with holes or loops, so I can sew, bolt, or screw them on, or embroider or sew beads onto them. I love glue. If you can’t sew it, sometimes you have to glue it. I crochet wire to encase an object or bind it to another object. You can see through a lot of the crocheted wire, look down into it and discover more layers, more visual treats.” Look through the pliers into the sound box of Meltzer’s eco friendly “House Music,” and you will see yourself. You can see more at bonniemeltzer.com.